© 2016 Benjamin Wills Price, Elizabeth Louise Allan, Kiran Marathe, Vivek Sarkar, Chris Simon, Krushnamegh Kunte. The cicadas of the Indian subcontinent, like many other insects in the region, have remained understudied since the early part of the 20th Century, and await modern taxonomic, systematic and phylogenetic treatment. This paper presents an updated systematic catalogue of cicadas (Hemiptera: Cicadidae) from India, Bangladesh, Bhutan, Myanmar, Nepal and Sri Lanka, the first in over a century. 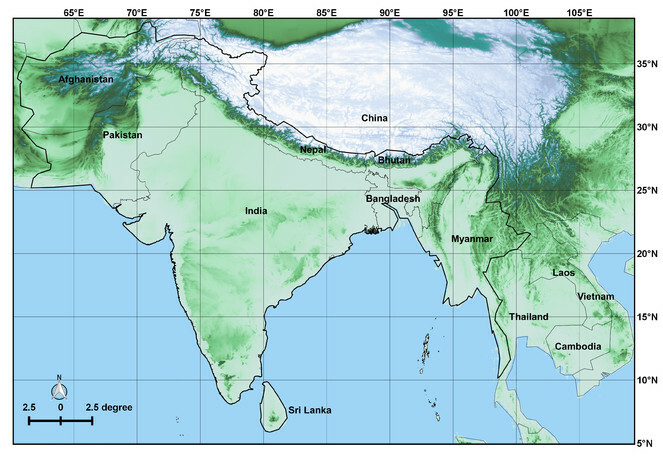 This paper treats 281 species, including: India and Bangladesh (189 species), Bhutan (19 species), Myanmar (81 species), Nepal (46 species) and Sri Lanka (22 species). For each species all recognized junior synonyms are included with information on the type material and additional specimens where relevant. The global distributional range and notes on the taxonomy of each species are included where appropriate. Two lists are provided: (1) species known to occur in India and Bangladesh (treated as a geographic unit), Bhutan, Myanmar, Nepal and Sri Lanka; and (2) species previously listed from these countries in error. A bibliography of species descriptions is provided, with the papers containing the original descriptions provided where copyright allows. We share our planet with an estimated 8.7 million species (Mora et al. 2011), of which approximately 80% await scientific description. Insects, although understudied, are known to account for over half the world’s described biodiversity (Foottit and Adler 2009), and likely constitute a much greater proportion of the undescribed biodiversity. The cicadas (Hemiptera: Cicadidae) of the Indian subcontinent, like many other insects in the region, have remained understudied since the early part of the 20th Century and await, for the most part, modern taxonomic, systematic and phylogenetic treatment. The first illustrated publication dealing with the insect fauna of India was “An epitome of the natural history of the insects of India and the islands in the Indian Seas” by Donovan (1800), which included many superb illustrations made by the author. One cicada species (Cicada indica Donovan 1800) was described by Donovan in his epitome, although the illustration is dated as 1st of February 1804 (Fig. 1). The original description states that the specimen was collected in Bengal, a claim doubted by Distant: "According to Donovan, a single specimen of this species was found in Bengal by Mr. Fichtel, and deposited in the Imperial Cabinet at Vienna, but that habitat I consider liable to the greatest doubt." (Distant 1889a). Donovan may have confused Fabricius’ label “Indiis” as India, when it could refer to the West Indies, East Indies or occasionally to Africa. In the present study Cicada indica is listed as unlikely to be from the Indian subcontinent, being synonymised with Tacua speciosa speciosa (Illiger, 1800) which is found in Indonesia and Malaysia. 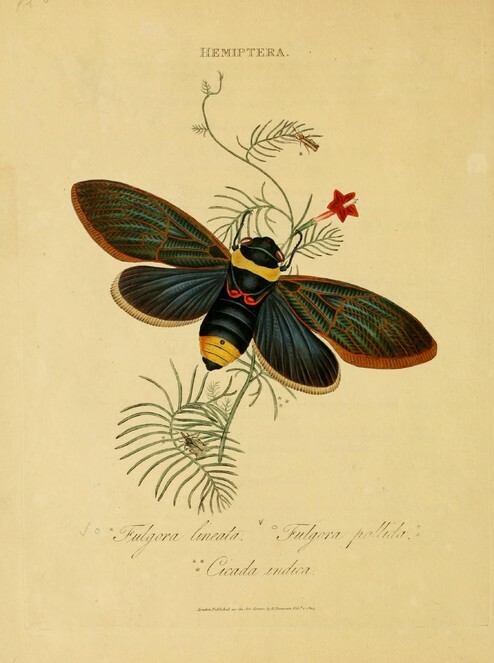 Donovan’s illustration of Cicada indica Donovan 1800. This stunning species is a junior synonym of Tacua speciosa speciosa (Illiger, 1800) and is not found on the Indian subcontinent, an example of the historical misattribution of species from the “East Indies” with India. By far the most influential figure in the history of cicadas in India is William Lucas Distant (12 November 1845 – 4 February 1922). Distant worked at the Natural History Museum, then the British Museum (Natural History) from 1889 to 1920, during which time he described a tremendous number of insect species. Over 100 cicada species which occur on the Indian subcontinent and were described by Distant are currently recognised as valid. His most significant works relevant to this fauna were: “A Monograph of Oriental Cicadidae” (Distant 1889b, Distant 1891, Distant 1892c); “The fauna of British India, including Ceylon and Burma” (Distant 1906c); and “A Synonymic Catalogue of Homoptera, Part I - Cicadidae” (Distant 1906b). In particular “The fauna of British India, including Ceylon and Burma” (Distant 1906c) provided the first treatment of the region as a whole, with 148 cicada species recognised in 44 genera. This was followed by an appendix (Distant 1916) which listed an additional 24 species and 3 new genera for the region, bringing the total to 172 cicada species in 47 genera. Apart from a few isolated species descriptions, the cicada fauna of the Indian subcontinent has not been subjected to a detailed taxonomic and systematic review since Distant (1906c), Distant (1916), hence, it is highly likely that many unrecognized and undescribed cicada species exist in this region. This study serves as a modern reference point for the cicada fauna of India, Bangladesh, Bhutan, Myanmar, Nepal and Sri Lanka, and hopefully, provides a backbone to recording efforts and studies of the underlying taxonomy. Pakistan, formerly a part of “British India” has been excluded from full review in this catalogue as it has recently been updated by Ahmed and Sanborn (2010), however the fauna are briefly compared. The checklists presented here are full of compromises but our guiding intention has been to present all the relevant information in a manner that is as compact and informative as possible. No doubt there are errors which have crept in, or which have not been discovered in the previous literature, and we welcome all suggestions to rectify any errors or omissions. To aide future studies the next incarnation will be digital, and the list of species is already in the process of migrating to a website, where updates will be maintained as and when changes occur. The website will also allow the community to share images and information on each species, providing an up-to-date resource, hopefully for many years to come. Historically the regions making up the Indian subcontinent have had a complex nomenclature (Figs 2, 3), further compounded by different authors interpreting locality labels to mean different regions. In particular the confusion between East India, East Indies, India, Indo-China and Indonesia, will mean that some species included in this list are unlikely to occur in the focal region, but are included until further study proves otherwise. 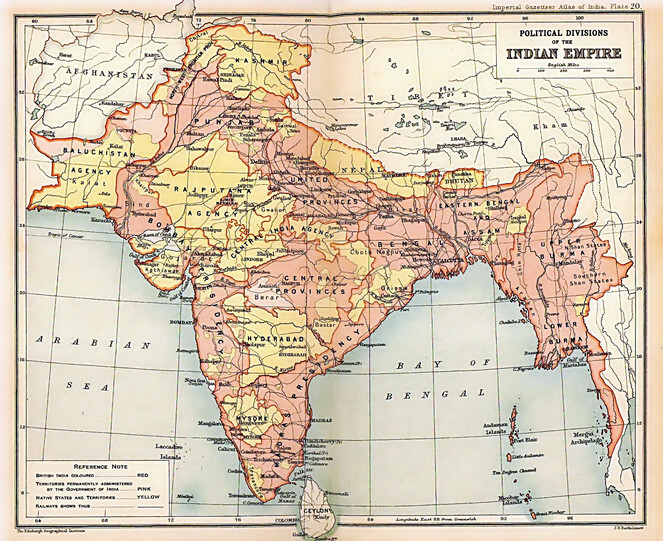 Map of the Indian subcontinent showing the historical extent of “British India” published in 1909. Map source Edinburgh Geographical Institute; J. G. Bartholomew and Sons. [Public domain], via Wikimedia Commons. Map of the Indian subcontinent, including countries as politically delineated at present that were at one time considered part of “British India” and countries surrounding “British India” with which the fauna of Bangladesh, Bhutan, India, Myanmar, Nepal, Pakistan and to a lesser extent Sri Lanka likely overlaps. The checklist was based on the “The fauna of British India, including Ceylon and Burma” (Distant 1906c) and its supplement (Distant 1916), the four catalogues which list the global cicada literature (Distant 1906b, Metcalf 1963, Duffels and van der Laan 1985, Sanborn 2014) and the material housed at the Natural History Museum, London. In addition species which have been described after 2010 were incorporated by searching Google Scholar (https://scholar.google.co.uk/) and ScienceDirect (http://www.sciencedirect.com/) using a combination of “India”, “Bangladesh”, “Bhutan”, “Myanmar”, “Nepal”, “Sri Lanka”, and “cicada” and “Cicadidae”. The checklist is based on either the locality of the type specimen, the locality of specimens whose identity has been verified or substantial literature evidence. This checklist follows the higher taxonomy of Sanborn (2014)​ with updated generic combinations including current information as of September 2015. Institutional abbreviations are summarized in Table 1. Summary of institutional abbreviations used in the checklists. Data sourced from Evenhuis (2015). (1) Species present in India and Bangladesh (treated here as a single unit), Bhutan, Myanmar, Nepal and Sri Lanka. (2) Species historically included in the countries listed above, but on analysis are very unlikely to be present in these countries, with reasons for their exclusion listed in the notes. We have not considered the cicada fauna of Pakistan as these species have recently been studied (Ahmed and Sanborn 2010). All type specimens examined were photographed (dorsal and ventral) and are accessible at: http://www.indiancicadas.org/. For each species recorded from the Indian subcontinent the original description was sourced. In addition, any publication listing the focal region (as summarized by the four major catalogues) was sourced and confirmed. The citation of each authority is linked in this manuscript through the Notes field and in addition is publically accessible on Mendeley as the “Cicadas of the Indian subcontinent”: http://mnd.ly/1OFGZc1. Original species descriptions without copyright restrictions can be downloaded from the NHM data portal: https://doi.org/10.5519/0028307. [Metcalf, 1963] Uttar Pradesh; India. [Metcalf, 1963] Bengal; India. [Duffels and van der Laan, 1985] Nepal. [Metcalf, 1963] Bengal; India; Malay Peninsula; Ceylon; Borneo; Malay States; Perak; Malacca; Singapore Island; Johore; Penang; Uttar Pradesh; Malaya. [Sanborn, 2014] Borneo, Sabah, Bengal, China, Sumatra, Java, India, Peninsular Malaysia, Sarawak, Manipur, West Bengal, Sri Lanka, Malay Peninsula. [Metcalf, 1963] Ceylon. [Duffels and van der Laan, 1985] Ceylon. [Sanborn, 2014] Ceylon. [Metcalf, 1963] Hindustan; Tenasserim; India; Laos; Borneo; Banguey. Authority: Walker 1858a; Species description states female, however Distant 1889a later figured a male. The holotype is likely a male as there is only one specimen in the NHMUK collection. [Distant, 1889/92] Continental India: Assam; Khasi Hills. [Metcalf, 1963] Hindustan; India; Assam; Northern India. [Sanborn, 2014] Thailand, Hindustan, India, China. [Metcalf, 1963] Assam; Northern India. [Metcalf, 1963] Assam; India. [Sanborn, 2014] Assam, Continental India. Authority: Distant 1890b; Unsure of number of specimens in species description, NHMUK has 2 male and 2 female specimens matching type description. [Metcalf, 1963] Assam; Cochin; India; Cochin China; Indochina. [Sanborn, 2014] Vietnam, India. Authority: Distant 1888a; Two specimens used in species description, however only one is present in the NHMUK collection, an additional specimen can be found under "Balinta sp" which may be the other syntype, however this requires additional study. [Distant, 1906] India: Sikkim; Margherita (Assam). Burma: Upper Regions. [Metcalf, 1963] Assam; Java; Sikkim; India; Burma. [Duffels and van der Laan, 1985] Bhutan; Nepal. [Sanborn, 2014] Assam. [Metcalf, 1963] Burma; Laos. [Sanborn, 2014] China, Guangxi, Burma, Thailand, Laos, Vietnam. [Distant, 1889/92] India: Darjeeling. [Metcalf, 1963] Hindustan; India; Bengal; Sikkim. [Sanborn, 2014] India. [Metcalf, 1963] United Provinces; India. [Metcalf, 1963] Nepal; Natal. [Duffels and van der Laan, 1985] Nepal. Authority: Distant 1912c; Multiple specimens (number unknown) used in species description. [Duffels and van der Laan, 1985] South India. [Distant, 1889/92] Continental India: Neelgiri Hills (northern slopes, 5000 ft). [Metcalf, 1963] Madras; India. [Distant, 1889/92] Continental India: Sikkim; Darjeeling. [Metcalf, 1963] Sumatra; India; Bengal; Malabar; Asia; Cuba (? ); Eastern India; Assam; Sikkim; Molucca Islands; Laos; Amboina; Malay Archipelago; Amboina (? ); Malay Peninsula; East Indies. [Duffels and van der Laan, 1985] Bhutan. [Sanborn, 2014] China, Hunan, Guangxi, Yunnan, Indonesia, Sikkim, India, Thailand, Sumatra, Laos, Malaysia, Indochina, Bhutan, Southeast Asia. [Metcalf, 1963] Sumatra; New Guinea; Madras; Philippine Islands; Eastern India; Japan; Singapore Island; Penang; India; Malay Peninsula; Borneo; British North Borneo; Kyushu; Oriental Region; Sarawak; Burma; Assam; Sikkim; Tenasserim; Northern Borneo; Malaya; Malacca; Perak; Johore; Southern Japan; Japan (? ); Kyushu (? ); Malay Archipelago. [Sanborn, 2014] Malaysia, Borneo, Indonesia, Krakataus, Sarawak, Sabah, Peninsular Malaysia, Sumatra, Philippines, Singapore, New Guinea, Thailand, West Malaysia, East Malaysia, Brunei, Kalimantan, Java, India?, New Guinea, Vietnam, Thailand, Luzon. [Metcalf, 1963] Burma; Siam; Malay States; Penang; Malay Peninsula; Borneo; Sumatra; Java; Mentawai Island; Siberut; India. [Sanborn, 2014] Sarawak, Burma, Peninsular Malaysia, Siam, Sumatra, India, Southeast Asia, Indonesia, Thailand. Authority: Distant 1888d. Metcalf (1963) listed India in reference Burma being part of "British India". The type locality (Teinzo) is within modern day Myanmar and the species has not yet been recorded from modern day India, however the species may be present on the India/Myanmar border. [Metcalf, 1963] Ceylon. [Duffels and van der Laan, 1985] Ceylon. [Sanborn, 2014] Sri Lanka. [Sanborn, 2014] Cooch Behar, Alipurduar, Kalingpong, N. Paschimbanga, NE India; Guwahati, Assam, NE India; Ri Bhoi District, Meghalaya, NE India. Authority: Hajong and Yaakop 2013; Species description included 1 male holotype, 23 male and 7 female paratypes. [Metcalf, 1963] Madras; Nilgiri Hills; India. [Sanborn, 2014] India. [Metcalf, 1963] East Indies; India. Authority: Metcalf 1963; type distribution only states "indes Orientales" (i.e. East Indies) and as this encompassed a large area of Asia it cannot be confirmed or denied as being from India. Metcalf (1963) stated India in reference to various lists and catalogues which all referred to the type specimen as from India. [Metcalf, 1963] Kashmir, India. [Sanborn, 2014] Pakistan, India. [Metcalf, 1963] Bengal; India; Northern Bengal; Afghanistan. [Metcalf, 1963] Northwestern Frontier Province; Northwestern India. [Sanborn, 2014] Pakistan, India. [Metcalf, 1963] Central Provinces; India. [Metcalf, 1963] Northwestern India. [Sanborn, 2014] Pakistan, India. [Metcalf, 1963] India; Baluchistan; Oriental Region; Northern India; Uttar Pradesh. [Sanborn, 2014] Pakistan, India. [Distant, 1889/92] India: Quetta; North Bengal. [Metcalf, 1963] India; Quetta; Bengal; Pakistan; Oriental Region; Baluchistan. [Sanborn, 2014] Pakistan, India. [Metcalf, 1963] India; Hindustan; Northern India; Oriental Region; Sind; Peshawar. [Sanborn, 2014] Pakistan, India. [Metcalf, 1963] United Provinces; India; Uttar Pradesh. [Metcalf, 1963] Korea, Borneo, Sumatra, Malay Peninsula, Tonkin, Malay States, Japan, Perak, Malacca, Singapore Island, Johore, Penang, Hong Kong Island, Oriental Region, Java, Sarawak, Malaya, Korea (? ), Formosa, Philippine Islands. [Duffels and van der Laan, 1985] Taiwan, Malaysia, Korea. [Sanborn, 2014] Sumatra, Malay Peninsula, Borneo, Indo-China, Borneo, Thailand, Burma, Laos, Vietnam, Malaysia, Sarawak, China, Brunei, Korea, Sabah, Southeast Asia. [Distant, 1889/92] Continental India: Sikkim; Darjeeling; Assam; Sylhet; Naga Hills; Neelgiri Hills (southern slopes). [Metcalf, 1963] Assam; Hindustan; East Bengal; India; Tonkin; Sikkim; Bengal; Eastern Himalayas; Madras; Uttar Pradesh. [Duffels and van der Laan, 1985] Himalaya. [Sanborn, 2014] China, Indo-China, Himalayas, India, Bangladesh, Bhutan, Nepal. Authority: Walker 1850; Species description states female, however the labelled type specimen examined in the NHMUK is male. [Metcalf, 1963] India. [Sanborn, 2014] India. Voucher number corresponds to one specimen. Specimen not part of type series, see taxon notes. [Metcalf, 1963] India; Sikkim; Ceylon; Madras. [Duffels and van der Laan, 1985] Ceylon. [Sanborn, 2014] India, Sri Lanka. Authority: Distant 1891; In the NHMUK there is a male specimen bearing a type label and a note from Broomfield dated 1978. This male specimen was described later by Distant (1913a). The type series includes four females from "Continental India: Neelgiri Hills, northern slopes, 3500 feet (Hampson-coll. Dist.)". [Metcalf, 1963] Andaman Islands. [Sanborn, 2014] Andaman Islands. Authority: Distant 1887a; Lectotype designated by Hayashi (1987b). [Metcalf, 1963] Java; Bengal; Tenasserim; Japan; China; India; Ceylon; Mysore; Malay States; Honshu; Kyushu; Ryukyu Islands; Oriental Region; Formosa; Sikkim; Malaya; Java (? ); Ceylon (? ); Northern Bengal; Madras; United Providences. [Duffels and van der Laan, 1985] Ceylon; Nepal. [Sanborn, 2014] India, Nepal, Burma, Himalayas. Authority: Signoret 1849 Not likely to be found in Sri Lanka. [Metcalf, 1963] Tenasserim; East Bengal; Upper Tenasserim. [Sanborn, 2014] Burma. [Lee, 2014] China: Fujian, Guangdong, Hunan, Guangxi, Hainan, Sichuan, Guizhou, Yunnan, Tibet. Vietnam; Laos; Cambodia; Thailand; Myanmar. [Metcalf, 1963] Northern India; China; Tonkin; Hong Kong Island; Tenasserim; Hainan; Indochina; Formosa; Japan; Kiangsu; Kwangsi; Sikang; Kiangsi. [Sanborn, 2014] Hongkong, Hainan, Tenasserim, Tonkin, Formosa, China, Hunan, Hubei, Jiangsu, Jiangxi, Zhejiang, Fujian, Taiwan, Guangdong, Guangxi, Guizhou, Sichuan, Yunnan, Laos, Vietnam, India, Southeast Asia, Thailand, Myanmar, Cambodia, Indochina. Authority: Distant 1891; Metcalf (1963) lists Northern India in reference to Atkinson (1884), however according to Distant (1891) "Mr. Atkinson* states that "the Indian Museum possesses a specimen" of C. operculata, Carreno, but this is probably erroneous, as he writes that the species was recorded from N. India, though Walker perhaps the greatest obscurantist who has yet appeared in entomology gave no locality to the specimens he identified under Carreno's name, without any reference to the place or manner of their description." [Distant, 1889/92] Continental India: Sylhet; North Khasi Hills; Neelgiri Hills (south slopes). [Metcalf, 1963] Assam; East Bengal; India; China; Tonkin. [Sanborn, 2014] Sumatra, Malay Peninsula, Borneo, India, Indo-China, Bangladesh, China, Vietnam, Laos, Thailand, Sunda, Asia, Guangxi, Cambodia. Authority: Walker 1850; The species description was based on a single female type specimen and the male of the species was later described in Distant (1879). [Metcalf, 1963] Bombay; India; Siam. [Sanborn, 2014] Thailand, India. [Metcalf, 1963] Assam; India; Burma; Indochina; Naga Hills. [Sanborn, 2014] China, Yunnan, India, Burma, Thailand, Assam, Southeast Asia, Vietnam, Myanmar, Indochina. [Metcalf, 1963] Bombay; Madras; India. [Duffels and van der Laan, 1985] India; Andaman Islands; Nicobar Islands. [Duffels and van der Laan, 1985] India; Andaman Islands; Nicobar Islands. [Duffels and van der Laan, 1985] Pakistan (? ); India. [Sanborn, 2014] Bangladesh. [Metcalf, 1963] Burma; Kiangsu; China. [Sanborn, 2014] China, Soochow, Karennee, Laos, Thailand, Vietnam, Jiangsu, Unnan, Sichuan, Burma, Japan, India, Tenasserim, Laos, Tonkin, Guangxi, Hainan, Myanmar. Authority: Distant 1892c; Lectotype was designated by Beuk (1996). There are an additional 3 male (2 MSNG; 1 BMNH) and 1 female (MSNG) paralectotypes, however only the examined material is included in this paper. Not from India: Sanborn (2014) states India in reference to Hua (2000) but no other records from India exist, it is likely the result of a mistranslation of Indo-China. The type locality (Carin Asciuii Ghecu, Tennasserim) is not near the India/Myanmar border. [Moulton, 1923]Terutau Island, Siam; North Khasia Hills; Assam; Indo-China. [Metcalf, 1963] Siam; Indochina; Assam; Malay Archipelago; Malay Peninsula; Terutau Island. [Sanborn, 2014] Thailand, Indochina, India, Malaysia, Vietnam. Authority: Moulton 1923; Lectotype designated by Beuk (1996). [Sanborn, 2014] Northern India, Northern Burma. Authority: Beuk 1996; An additional 21 male paratypes (9 SEM; 6 ZMA; 6 NHMUK) and 1 female paratype (NHMUK) were designated in the species description, however only the material from India is included here. Authority: Beuk 1996; An additional 1 female paratype (SEM) was designated in the species description. [Metcalf, 1963] Burma; Northwestern Burma; India; Tenasserim; Cochin China; Indochina; China; Siam; Japan. [Sanborn, 2014] Peninsular Malaysia, Thailand, China, Yunnan, India, Burma, Cambodia, Laos, Vietnam, Indochina, Tenasserim, Conchin China, Siam, Malay Peninsula, Myanmar, . Authority: Distant 1881; Lectotype designated by Beuk (1996). [Metcalf, 1963] Burma; India; Siam; Indochina. [Duffels and van der Laan, 1985] Thailand; Andaman Islands; Nicobar Islands. [Sanborn, 2014] China, Yunnan, Nanking, India, Burma, Peninsular Malaysia, Borneo, Sarawak, Cambodia, Laos, Thailand, Vietnam, Malay Peninsula, Sumatra, Conchin-China, Jiansu, Indochina, Sabah, Tenasserim, Siam, Indonesia, Myanmar. [Metcalf, 1963] Java; Malay Peninsula; Sumatra; Nias; Sumbawa; Borneo; Molucca Islands; British North Borneo; Malay States; Amboina; Malaya; North Borneo; Sarawak; Southeastern Borneo; Penang; Sulu Islands; Lombok; Timor; Palawan; Singapore Island; Perak; Johore; Western Borneo; Malacca; Malay Archipelago; Krakatau; Verlaten Island; New Guinea; Sebesi; Mentawei Islands; Siberut; Sipora; Christmas Island; Lang Island. [Duffels and van der Laan, 1985] SE Asia; Malaysia; Sabah; Borneo; Philippines. [Sanborn, 2014] Borneo, Sabah, Sarawak, Java, New Guinea, Krakatau, Verlaten, Sebesi, Nias, Mentawi, Ambiona, Sumatra, Siam, Peninsular Malaysia, Celebes, Singapore, Indonesia, Bantam Island, Sabah, Assam, Philippine Republic, Laos, Irian Jaya, Malacca, India, Myanmar, Malaysia, Elopura, Moluccas, Sumbawa. [Metcalf, 1963] India; Eastern India; Assam; Perak; Malay Peninsula; Indochina; Malaya; Bengal. [Sanborn, 2014] China, Malaysia, Borneo, Sarawak, Sabah, Myanmar, Tenesserim, Assam, Indo-China, Thailand, Sumatra, Sunda, Asia, Vietnam. [Distant, 1889/92] Continental India: Sikkim and Naga Hills; Assam; Seebsagar; North Khasi Hills (1500-3000 ft). Burma: Bhamo; Moulmein. Tenasserim: Myitta-in-the-Valley. [Metcalf, 1963] Sumatra; Java; Assam; Australia; Tenasserim; Hong Kong Island; Borneo; Philippine Island; Morotai; Penang; Sikkim; India; Burma; Nias; Malay Peninsula; Celebes; China; Sinkep Island; Malacca; Palawan; Indochina; Malay States; Australia (? ); Malayan Region; Oriental China; Tara bland; Mindanao; Sibuyan Island; Northern Australia; North Borneo; Banguey; Sarawak; Malaya; Malay Archipelago; Johore; Sulu Islands; Molucca Islands; Amboina; Lombok; Sumbawa; Timor; Singapore Island; Perak; Korea; British India; Kwangtang; Eastern China; Mentawai Islands; Pagi Islands; Jainan bland; Bengal; Oriental Region; Siberut. [Sanborn, 2014] China, Malaysia, Australia, Sikkim, Assam, Burma, Tenasserim, Sumatra, Java, Borneo, Celebes, Philippines, Irian Jaya, Sarawak, Sabah, Greater Sunda Islands, Southeast Asia, Peninsular Malaysia, India, Brunei, Hong Kong, Taiwan, Langkawi Island, Vietnam, Greater Sunda Islands, Philippine Republic, Japan, Malay Archipelago, Mindanao, southern China, Southern Myanmar, Panay, Luzon, Sibuyan, Palawan, Yunnan. [Distant, 1889/92] India: Bombay; Khandala. [Metcalf, 1963] Bombay; India. [Metcalf, 1963] Bengal; Northern India; Indochina; India. [Duffels and van der Laan, 1985] Nepal. [Sanborn, 2014] Vietnam, Nepal, India. [Metcalf, 1963] Assam; India; Indochina. [Duffels and van der Laan, 1985] Bhutan. [Sanborn, 2014] Vietnam, China, Xizang, Bhutan, India. [Metcalf, 1963] India; Assam; Fukien. [Sanborn, 2014] Thailand, India, Assam, Fukien. [Metcalf, 1963] Bombay; India; Travancore; Northern India. [Sanborn, 2014] Western ghats, southern India; India). [Distant, 1889/92] Continental India: Sikkim; Assam; Naga and Khasi Hills; Margherita. Burma: Carin Ghecu. [Metcalf, 1963] Assam; Sikkim; Burma; China; India. [Sanborn, 2014] China, Guangdong, Hunan, Guangxi, Thailand, Guizhou, Sichuan, Yunnan, Burma, Sikkim, India, Burma, Assam, Tonkin. [Distant, 1889/92] Continental India: Sikkim; Naga Hills; Khasi Hills; Samagooting; Dhansiri Valley; (var consors) Margherita. [Metcalf, 1963] China; Syria; India; Asia; Sikkim; Burma; Hong Kong Island; Australia; South Australia; Tonkin; Assam; Northern Territory (? ); Indochina; Kwangtung; Australia (? ); Northern Territory; Japan; Kwangsi; Hainan Island; Fukien; Bengal. [Sanborn, 2014] China, Kwangsi, Sikhim, Assam, Naga Hills, Khasi Hills, Margherita, Samagooting Valley, Dhansiri Valley, Burma, Karenne, Tonkin, Hong Kong, Myanmar, India, Vietnam, Guangxi, Jiangxi, Fujian, Guangdong, Hainan, Guizhou, Sichuan, Japan, Indonesia, Malaysia, Burma, Bangladesh, Australia, Southeast Asia, Sri Lanka, North Vietnam, South China. [Metcalf, 1963] India; Himalayas; Sikkim; China; Assam. [Duffels and van der Laan, 1985] Nepal. [Sanborn, 2014] China. [Metcalf, 1963] Sikkim; United Provinces; Northern India. [Sanborn, 2014] China, Yunnan, Hainan, Thailand, Sikkim, India. [Metcalf, 1963] Burma. [Sanborn, 2014] China, Burma. Authority: Distant 1897; Metcalf (1963) listed India in reference to Mathur (1953) in which Burma was considerd a part of "British India". The type locality (Chin Hills) extends into India (Lushai Hills - Nagaland), thus this species may be recorded in Nagaland in future. [Distant, 1906] Burma: Teinzo; Karen Hills. Upper Tenasserim. [Metcalf, 1963] Tenasserim; India; Burma; Laos; Indochina. [Sanborn, 2014] Pakistan (? ), Burma, India, Yunnan, China, Laos, Thailand, Tenasserim, Indochina, North Vietnam, Myanmar, Vietnam, Bangladesh (?). Authority: Distant 1881; Metcalf (1963) stated "India" in reference to Atkinson (1886) who was referring to the type specimen from Upper Tenasserim (Myanmar). Metcalf (1963) also listed India in reference to Mathur (1953) who stated "India.-Burma: Katha, Mohnyin Res." as a part of then "British India". Listings of India since then are likely to be in reference to published localities, most likely that from Metcalf (1963). In addition, Sanborn (2014) listed Pakistan and Bangladesh in reference to a specimen collected in Chittagong (former "East Pakistan" now Bangladesh), however the identification of the specimen from Chaudhry et al. (1970) (Aola sp.? bindusara) has not been confirmed thus the Bangladesh distribution is not conclusive at this point. [Distant, 1889/92] India: Assam, North Khasi Hills (1500-3000 ft); Naga Hills. [Metcalf, 1963] Assam; India; Laos. [Sanborn, 2014] China, Yunnan, India, Laos, Thailand, Vietnam, Assam, Guangdong, Fujian. [Metcalf, 1963] Burma; India. [Sanborn, 2014] Thailand. Authority: Ollenbach 1929; Metcalf (1963) listed India in reference Burma being part of "British India". The type locality (Thandaung) is within modern day Myanmar and the species has not yet been recorded from modern day India. [Distant, 1889/92] Continental India: North India; Sikkim; Margherita (Upper Assam); Naga Hills. [Metcalf, 1963] India; Hindustan; Northern India; Sikkim; Mysore; Assam; Bengal; Northern Bengal; Northern United Provinces; Uttar Pradesh. [Duffels and van der Laan, 1985] Nepal. [Sanborn, 2014] India, North India, Pakistan. [Distant, 1889/92] Continental India: Margherita (Upper Assam). Burma: Teinzo. Tenasserim: Meetan. [Metcalf, 1963] Burma; Tenasserim; India; Tonkin; Assam; Indochina; Cambodia; Yunnan; Madras; China. [Sanborn, 2014] China, Yunnan, Burma, Annam, Cambodia, Pakistan, India, Xinjiang, Guangxi, Thailand, Tonkin, Asia, Vietnam, Indochina, Myanmar, Bangladesh. [Lee, 2009] India. [Sanborn, 2014] India. [Metcalf, 1963] Assam; Sumatra; Malay Archipelago; India; Tonkin; Kwangsi; Fukien; China. [Sanborn, 2014] China, Guangxi, Yunnan, India, Malaysia, Thailand, Vietnam, Thailand, Indonesia, Assam, Sumatra, South China. [Distant, 1906] India; Tenasserim; Philippines. [Haupt 1924] Tenasserim (Mt. Mooleyit); Calcutta. [Metcalf, 1963] Tenasserim; India; Philippine Islands; Bengal; Kwangsi; China. [Sanborn, 2014] China, Guangxi, India, Philippines. [Metcalf, 1963] Tranquebar; Madras; India; China; Asia; Bengal; Sumatra. [Metcalf, 1963] China; India; Java; Assam; Philippine Islands; Bengal; Tenasserim; Northern Bengal; Silhet; Northern India; Burma; Hong Kong Island; Japan; Formosa; Borneo; Kiangsu; Chekiang; Anhwei; Shantung; Kiangsu (? ); Eastern China; Kwangsi; Asia. [Duffels and van der Laan, 1985] Taiwan; China. [Sanborn, 2014] China, Haichos, Nanking, Soochow, Hangchow, Burma, Formosa, Anhui, Jiangsu, Jiangxi, Zhejiang, Taiwan, Hainan, Guangxi, Yunnan, India, Vietnam. [Distant, 1889/92] India: Sikkim; Assam; Calcutta. Burma: Kakhien Hills (Rangoon); Thagata (Tenasserim). [Metcalf, 1963] China; France; Sumatra; America; India; Bengal; Hong Kong Island; Asia; Java; Malacca; Timor; Tenasserim; Singapore Island; Sikkim; Calcutta; Japan; Sibsagar; Tonkin; Burma; Nias; Molucca Islands; Sumbawa; Borneo; Laos; Lombok; Assam; Malay Peninsula; Malay States; Macao; Hupeh; Formosa; Palawan; Tanimbar Islands; Philippine Islands; Sulu Island; Amboina; Perak; Johore; Penang; Oriental Region; Cochin China; Sunda Islands; Indochina; Malay Archipelago; Malaya; Sarawak; Fukien; Kwangtung; Southern Asia; Eastern India; Madras; Siam; Celebes; Southern China; Telo Island; Batu Islands; Kiangsu; Kwangsi; Lower Burma; Chekiang; Indonesia; Hainan. [Duffels and van der Laan, 1985] Taiwan; Andaman Islands; Nicobar Islands; Japan; China; Philippines. [Sanborn, 2014] China, Soochow, Kwangsi, Canton, Macao, Han-lik, Hangchow, Sikhim, Assam, Brahmaputra, Calcutta, Burma, Rangoon, Kakhein Hills, Tenasserim, Thagata, Myitta, Malay Peninsula, Sumatra, Borneo, Timor Laut, Tonkin, Than-Moi, Formosa, Pakistan, India, Hong Kong, Siam, Singapore, Hunan, Shaanxi, Henan, Hubei, Jiangsu, Zhejiang, Jiangxi, Fujian, Taiwan, Guangdong, Hainan, Guangxi, Sichuan, Yunnan, Indonesia, Kalimantan, Sikkim, Maymer, Andaman Island, Nicobar Island, Southeast Asia, Timor, South China, Palawan, Leyte. [Distant, 1889/92] Burma: Karen Hills; Ruby Mines; Myitta (Tenasserim). [Metcalf, 1963] Tenasserim; Hindustan; Burma; Upper Burma; Assam; Malaya Peninsula; Silhet; India. [Duffels and van der Laan, 1985] India. [Sanborn, 2014] China, Yunnan, Burma, Malaysia, Southheast Asia, Vietnam. [Distant, 1889/92] Continental India: Eastern Himalaya Mts; Sikkim. [Metcalf, 1963] Hindustan; India; China; Sikkim; Eastern Himalayas; Northern Bengal; Assam. [Duffels and van der Laan, 1985] Nepal. [Metcalf, 1963] Mysore; India; Northwestern India; Uttar Pradesh. [Metcalf, 1963] Mysore; India; Uttar Pradesh. [Distant, 1906] India: Simla; Tehri-Garhwal. [Metcalf, 1963] Punjab; India; Uttar Pradesh. [Duffels and van der Laan, 1985] Bhutan; Nepal. [Sanborn, 2014] Pakistan, India, Bhutan, Nepal. Authority: Distant 1888c; Distant (1906c) states that the type specimen is male. [Metcalf, 1963] Yunnan; China. [Duffels and van der Laan, 1985] Nepal; China. [Sanborn, 2014] China, Yunnan, Nepal. [Metcalf, 1963] Burma. [Sanborn, 2014] China, Yunnan, Burma, Thailand. [Distant, 1906] India: Bombay; Karwar. Burma: Thaungyin (Tenasserim). [Metcalf, 1963] India; Bombay; Tenasserim. [Metcalf, 1963] Hindustan; India; Burma; Uttar Pradesh. [Sanborn, 2014] Hindustan. [Distant, 1889/92] India: Bombay Province; Karwar. [Metcalf, 1963] Southern India; Bombay (? ); India; Tonkin. [Sanborn, 2014] China, Guangxi, india, Vietnam. [Metcalf, 1963] India; Assam. [Sanborn, 2014] India: Margherita, Manas Tiger Reserve, Assam; Cooch Behar, N. Paschimbanga. [Distant, 1906] India: Bombay; Karwar; Mussooree. [Metcalf, 1963] Bengal; India; Northern India; Mysore; Bombay; Indochina; Madras; United Provinces; Central Provinces; Uttar Pradesh. [Duffels and van der Laan, 1985] Nepal. [Sanborn, 2014] Vietnam, Nepal, India, Oriental Region. [Distant, 1889/92] Continental India: N. India; Sikkim. [Metcalf, 1963] India; Northern India; Tonkin; Sikkim; Assam. [Sanborn, 2014] China, Guangxi, Yunnan, India, Sikkim, Vietnam, Tonkin, Thailand, North Vietnam. [Distant, 1906; Distant, 1889/92] Continental India: Sikkim; Assam (Khasi Hills). [Metcalf, 1963] Java; Malacca; India; Japan; Sikkim; Assam; Daito Islands; Kyushu; Honshu; Ryukyu Islands; Formosa; Oriental Region; Japan (?). [Duffels and van der Laan, 1985] Taiwan; Java; India; Nepal. [Sanborn, 2014] Nepal, India. [Metcalf, 1963] India; Eastern India; Bombay. [Sanborn, 2014] India. [Metcalf, 1963] Baluchistan; India; Quetta; Pakistan; Northwestern India. [Sanborn, 2014] China, Xinjiang, Pakistan, India. Authority: Distant 1888b; Multiple specimens (number unknown) used in species description. [Distant, 1889/92] India: Sikkim; N.W. Himalaya. [Metcalf, 1963] India; Hindustan; Northern India; Mysore; Sikkim; United Provinces; Northwestern Himalayas; China; Uttar Pradesh. [Duffels and van der Laan, 1985] China; India. [Sanborn, 2014] China, Mussooree, Himalya, Sikhim, India. [Metcalf, 1963] Assam; India; Uttar Pradesh. [Sanborn, 2014] China, Yunnan, India, Thailand, Vietnam. [Sanborn, 2014] Thailand, Myanmar, Laos. Authority: Boulard 2003; An additional 6 male paratypes (MNHN) were designated in the species description. [Distant, 1889/92] Continental India: Nepal; Ranikhet; Sikkim; Assam; Sylhet (Bangladesh). [Metcalf, 1963] Nepal; Northern Bengal; Assam; Northern India; Java; Sikkim; India; Bengal; Indochina; Malay Peninsula; Uttar Pradesh. [Duffels and van der Laan, 1985] Nepal; Bhutan. [Sanborn, 2014] India, Manipur, Assam, Naga Hills, Utta Pradesh, West Bengal, Indochina, Malay Peninsula, Nepal, Pakistan, Vietnam, Indonesia, Java, Bangladesh, Bhutan. [Metcalf, 1963] Tonkin, Indochina, China [Duffels, 1985] Thailand [Sanborn, 2014] Vietnam, China, Yunnan, Hainan, Laos, Thailand, Myanmar, India, Indochina, Tonkin, Hainan. Authority: Jacobi 1905; Sanborn (2014) states "India" in reference to Hua (2000), which may have been a mistranslation of Indochina, and to Lee (2008), which may be a repeat of the record from Hua (2000). [Distant, 1889/92] Continental India: Sikkim; Naga Hills. Burma: Bhamo. [Metcalf, 1963] Sikkim; Burma; India; Assam; Northern Bengal; Upper Burma; Uttar Pradesh. [Duffels and van der Laan, 1985] Himalaya; Thailand; Nepal. [Sanborn, 2014] China, Yunnan, Jiangxi, Hainan, Burma, Sikkim, Nepal, India, Thailand, Sri Lanka, Bhutan, Laos, Manipur, Assam, Meghalaya, Uttar Pradesh, West Bengal, Myanmar, Pakistan, Himalayas. [Lee and Emery, 2013] Tibet; India. Authority: Lee and Emery 2013; An additional 2 male and 9 female paratypes (AMS) were designated in the species description, however only material from India is included here. [Distant, 1889/92] India: Darjeeling (North India). [Metcalf, 1963] Northern India; Bengal; India; Java; Malay States; Malaya. [Duffels and van der Laan, 1985] Nepal. [Sanborn, 2014] India. Authority: Distant 1881; Species description states female, however the type specimen is male (Distant 1891). [Metcalf, 1963] Bhutan; China. [Sanborn, 2014] China, Xizang, Bhutan. [Metcalf, 1963] Burma; India. [Sanborn, 2014] Burma, Thailand. Authority: Ollenbach 1929; Not from India: Metcalf (1963) listed India in reference to Mathur (1953), in which it states "India.-Burma: Tavoy" with Burma being considerd part of "British India". [Metcalf, 1963] Tenasserim; Indochina; India; Burma. [Sanborn, 2014] Thailand, India, Burma, Indochina, Laos, Myanmar, Vietnam. Authority: Distant 1905a; Not from India: Metcalf (1963) listed India in reference to Mathur (1953), in which it references a specimen "India.-Burma: Tavoy" with Burma being considerd part of "British India". The type locality (Thaungyang Valley, Tennasserim) and Mathur's locality Tavoy (now Dawei) are both in the far south of Myanmar thus this species has been removed from the Indian list. Subsequent "India" localities as stated in Sanborn (2014), in reference to Boulard (2001b), Sanborn et al. (2007) and Lee (2008), are likely to have resulted from this initial error. Hayashi (1993) excluded this species from India. [Metcalf, 1963] United Provinces; Northern India. [Metcalf, 1963] Ceylon. [Duffels and van der Laan, 1985] Ceylon. [Sanborn, 2014] China, Yunnan, Sikkim, Sri Lanka. Authority: Distant 1902; Sanborn (2014) listed locality including Sikkim in reference to Lei (1994). This may be in error as the species has been recorded from Sri Lanka previously. [Distant, 1889/92] India: North India; Sikkim. [Metcalf, 1963] India; Northern India; Tonkin; Sikkim; Indochina. [Sanborn, 2014] China, Yunnan, Tibet, India, Sikkim, Vietnam, South China, India, Hainan. [Metcalf, 1963] Assam; India; Kwangtung; China; Fukien. [Sanborn, 2014] China, Fujian, Guangdong, Sichuan, Yunnan, India, Hong Kong, Yunnan. [Distant, 1889/92] Burma: Tavoy (Tenasserim). [Metcalf, 1963] Burma; Tenasserim; Malay Peninsula; Pahang; Thailand. [Sanborn, 2014] Thailand, Tenasserim, Burma, Peninsular Malaysia, Yunnan, Malaysia. Authority: Distant 1888c; In the NHMUK there is a male specimen bearing a type label, and a note from Beuk dated 1995. This male was described later from Burma by Distant (1891). The type is in the NZSI and is from "Tavoy". [Distant, 1906] India: Sikkim; Assam, Margherita and N. Khasi Hills. [Metaclf, 1963] Assam; India; Tonkin; Sikkim; Bengal; Indochina; Kwangsi; China; Kwangtung; Madras; Northern Bengal. [Sanborn, 2014] China, Kwangtung, Kwangsi, Sikhim, Assam, Margherita, Khasi Hills, Sichuan, Yunnan, Sri Lanka, Vietnam, South China, India. [Metcalf, 1963] Burma; India. [Sanborn, 2014] Pakistan, Burma. [Metcalf, 1963] Kashmir; India; Uttar Pradesh. [Sanborn, 2014] Pakistan, India. [Metcalf, 1963] Java; Philippine Island; Hindustan; India; Tenasserim; China; Sumatra; Assam; Malay Archipelago; Hong Kong Island; Palawan; Malaya; Indochina; Kwangtung; Tonkin. [Duffels and van der Laan, 1985] Nepal; China. [Sanborn, 2014] China, Assam, Khasi Hills, Margherita, Tenasserim, Thaga, Java, Sumatra, Philippines, Tonkin, Malaysia, Guangdong, Hong Kong, Yunnan, Xizang, Indonesia, Vietnam, India, Nepal, Southeast Asia, Thailand, Philippine Republic, Malayan Archipelago, North Vietnam, Palawan. [Distant, 1889/92]: India: Naga Hills and Margherita (Assam). Burma: Ruby Mines. [Metcalf, 1963]: Northern China, India Burma; China; Assam; Formosa; Oriental Region; Japan; Indochina; Kwangtung; Chekiang; Eastern China; Kwangsi; Fukien. [Duffels and van der Laan, 1985] Taiwan; China; India; Assam; Burma. [Sanborn, 2014] India: Assam, Margherita, Naga Hills; China: Hunan, Zhejiang, Liaoning, Shanxi, Gansu, Hubei, Jiangsu, Jiangxi, Fujian, Guangdong, Guangxi, Sichuan, Yunnan; Burma: , Arisan, Taiwan (Formosa); Hong Kong; Korea, Thailand, Indochina, Southeast Asia, Vietnam. [Distant, 1889/92] India: Sikkim; Darjeeling; Naga Hills. [Metcalf, 1963] Sumatra; Northeastern India; India; Sikkim; Assam; Bengal; Northern Bengal; Sumatra (? ); Uttar Pradesh. [Duffels and van der Laan, 1985] Nepal. [Sanborn, 2014] China, Vietnam, Nepal, India, Indonesia. [Distant, 1889/92] India: Sikkim; Darjeeling; Naga Hills. [Metcalf, 1963] Sumatra; Northeastern India; India; Sikkim; Assam; Bengal; Northern Bengal; Sumatra (? ); Uttar Pradesh. [Metcalf, 1963] Assam; Silhet; India; Burma; Tonkin; British India; Indochina; Uttar Pradesh. [Sanborn, 2014] Vietnam, Myanmar, Bangladesh, India. [Metcalf, 1963] Hong Kong Island; Fukien; China; Northern China; Formosa; Macao Island; Oriental Region; Japan; Southern China; Kwangtung; Assam; Anhwei. [Duffels and van der Laan, 1985] China. [Sanborn, 2014] China, Macao, Hongkong, Assam, Formosa, Anhui, Zhejiang, Fujian, Taiwan, Hunan, Guangxi, India. [Distant, 1889/92] India: Sikkim; Assam; Naga Hills; Margherita; Mungpoo (Bengal). Burma: Momeit; Rangoon; Charin. [Metcalf, 1963] Hindustan; Java; India; Burma; Sikkim; Assam; Bengal; Malay States; Malaya; Indochina; Malay Peninsula; East Indies; Tenasserim; Northern Bengal; Upper Burma; Indo-Malay Peninsula. [Sanborn, 2014] China, Borneo, Sabah, Thailand, India, Malaysian Archipelago, Java, Bengal, Burma, Malaysia, Vietnam, Indonesia, Myanmar, Vietnam. [Metcalf, 1963] Eastern India; India; Malaya; Malay Archipelago; Sikkim; Malay Peninsula; Krakatau Islands. [Sanborn, 2014] Indonesia, Krakatau. [Distant, 1889/92] India: Mungpoo (Bengal); Naga Hills and Margherita (Assam). Burma: Momeit. [Metcalf, 1963] Java; India; Burma; Malay Peninsula; Bengal; Assam; Malay States; Banguey Island; Malaya; Perak; Borneo; Malacca; Singapore Island; Johore; Penang; Tenasserim; Indochina; Philippine Islands; Sikkm; Sumatra; Upper Burma; Malay Archipelago. [Sanborn, 2014] Borneo, Sarawak, Java, India, Burma, Peninsular Malaysia, Banguey Island, Philippines, Sabah, Banguey Island, Vietnam, Indonesia, Sumatra, Myanmar. [Lee and Emery, 2013] India. [Distant, 1906] Continental India: Sikkim; Mussoore; Darjeeling. [Metcalf, 1963] Borneo; India; Java; Sikkim; Mysore; Bengal; Tibet; Sarawak; British India; Yunnan; Northern India; China; Assam; Uttar Pradesh. [Duffels and van der Laan, 1985] Tibet; China; Nepal; China. [Sanborn, 2014] China, Yunna, Tibet, India, Sikkim, Darjiling, Yunnan, Sichuan, Xizang, Indonesia, Java. [Lee and Emery, 2014] India. [Metcalf, 1963] Burma. [Duffels and van der Laan, 1985] Nepal. [Metcalf, 1963] India; Northern India; Afghanistan; Baluchistan. [Duffels and van der Laan, 1985] Afghanistan; Kazakhstan (U.S.S.R.); Kashmir. [Sanborn, 2014] Pakistan, Kazakhstan, Afghanistan, India. Authority: Walker 1850; Walker (1850) specified the type as a male in the species description, Distant (1892a) later states, in error, that the type was a female. [Metcalf, 1963] China; Yunnan; Sikkim; Burma; Tenasserim; Western Yunnan; Kiangsu; India. [Duffels and van der Laan, 1985] Thailand; Nepal; Bhutan; China. [Sanborn, 2014] China, Jiangsu, Jiangxi, Yunnan, Burma, India, Nepal, Bhutan, Thailand, Laos, Southeast Asia. [Metcalf, 1963] India; Assam. [Sanborn, 2014] India. [Metcalf, 1963] Northern India; Himalayas. [Duffels and van der Laan, 1985] Nepal. Not Lectotype, see taxon notes. [Distant, 1906] India: Assam. Burma: Karennee; Karen Hills. [Metcalf, 1963] Burma; Assam. [Sanborn, 2014] Burma, India. Authority: Distant 1892c; Beuk (1998) designated a male Lectotype: "Lectotype [male] (here desginated) of Cosmopsaltria ficulnea Distant: 'Carin Ghecu / 1300-1400 m / L. Fea II-III.88' [printed] and 'Cosmopsaltria / ficulnea / type Dist.' [Distant's handwriting]". Hence the specimen labelled as the Lectotype in NHMUK is actually the Paralectotype. An additional 2 male (1MSNG, 1 NHMUK) paralectotypes were designated. [Distant, 1889/92] Continental India: Bombay; Neelgiri Hills (Koonoor, 6000 ft). Ceylon. [Metcalf, 1963] Ceylon; India; Eastern India; Bombay; Kiangsu. [Duffels and van der Laan, 1985] Ceylon; China. [Sanborn, 2014] China, Jiangsu, India, Sri Lanka. [Sanborn, 2014] Burma, Laos, Thailand, Vietnam, Southern China, Yunnan, China, Myanmar, Cambodia. Authority: Beuk 1998; An additional 30 male paratypes (9 IZUI; 2 BPBM; 10 SUU; 1 MNHN; 4 NHMUK; 2 ZMAN; 1 USNM; 1 CASC) and 5 female paratypes (1 BPBM; 2 SUU; 2 NHMUK) were designated in the species description, however only the material from Myanmar is included here. [Metcalf, 1963] Indochina. [Sanborn, 2014] Thailand, Burma, Laos, India, Indochina, Vietnam, China, Yunnan, Guangxi, Jiangxi, Hainan, Laos, Cambodia, Myanmar. Authority: Distant 1913b; Female described by Boulard (2005). Sanborn (2014) listed India in reference to Boulard (2005). This species was described from Indo-China and there are currently no records of this species known from the Indian region, however it is present in the surrounding countries. [Distant, 1889/92] Continental India: Madras Presidency; Naga Hills; Sikkim; Assam. Burma: Teinzo. [Metcalf, 1963] Madras; India; Burma; Siam; Thailand; Sikkim; Assam; Indochina; Bengal. [Duffels and van der Laan, 1985] Nepal. [Sanborn, 2014] India, China, Yunnan, Burma, Sikkim, Nepal, Thailand, Peninsular Malaysia, Assam, Bhutan, Nepal, Cambodia, Laos, Vietnam, China Hainan, Sichuan, yunnan, Indo-China, Peninsular Thailand, Taiwan, Guangxi, Jingxi, Hainan, Southeast Asia, Vietnam. Authority: Distant 1881; Lectotype designated by Beuk (1998). [Distant, 1889/92] Continental India: Margherita (Assam); Naga Hills; Sylhet (Bangladesh). [Metcalf, 1963] India; Assam; East Bengal; Ceram; Malay Peninsula; Malacca. [Metcalf, 1963] India; Cape of Good Hope (? ); Eastern India; Nicobar Islands. [Sanborn, 2014] India Oriental. [Metcalf, 1963] Andaman Islands; India. [Sanborn, 2014] Andaman Islands. [Distant, 1889/92] Continental India: Daejeeling; Assam: Seebsager and Naga Hills; Khasi Hills . ; [Metcalf, 1963] Assam; Sibsagar; India; Uttar Pradesh. [Duffels and van der Laan, 1985] Bhutan. [Sanborn, 2014] China. [Metcalf, 1963] Tenasserim; Lower Burma; Indo-China; Perak; Burma; Tonkin; Malay Penninsula. [Sanborn, 2014] China, Vietnam, Thailand, India, Burma, Vietnam, Tenasserim, Burma, North Vietnam, Yunnan, Malaysia, Myanmar. Authority: Distant 1888c; In the NHMUK there is a male specimen bearing a type label, however this male was described later by Distant (1913b). Holotype is a female from "Tenasserim: Houngdarau Valley" (MSNG). Not from India: Sanborn (2014) states India in reference to Sanborn et al. (2007) and Lee (2008), however their inclusion of India is in reference to previous distributions that may be incorrect, having resulted from Indo-China being included as India. Further evidence is required before this species can be included in the fauna of this region. [Metcalf, 1963] Bengal; India; Northern Bengal; British India; Uttar Pradesh. [Sanborn, 2014] Pakistan, India. [Distant, 1889/92] Continental India: Karwar. [Metcalf, 1963] India; Bombay; Madras; Mysore; Coorg. [Sanborn, 2014] India. [Metcalf, 1963] India; Eastern India; British India. [Metcalf, 1963] Ceylon; Java; India; Hyderabad; Madras; Central Provinces; United Provinces; Japan; Madhya Pradesh; Uttar Pradesh. [Duffels and van der Laan, 1985] Ceylon. [Sanborn, 2014] Sri Lanka, India. [Metcalf, 1963] Bengal; Northern India; India; Northern Bengal. [Distant, 1889/92] India: Dekhan. [Metcaf, 1963] Eastern India; Northern India; India; China; Deccan; Central China; Oriental Region; Chusan Archipelago; Tonkin; Chusan Islands. [Sanborn, 2014] China, Chusan, Guangdong, Guangxi, Zhejiang, Vietnam, India. [Distant, 1889/92] India: Neelgiri Hills, n. slopes, 3500 and 5000 ft. [Metcalf, 1963] Madras; India. [Sanborn, 2014] India.